NGC 2685 (also known as the Helix Galaxy or Arp 336) is a polar ring galaxy of about 50,000 light-years across, located some 42 million light-years away from Earth in the northern constellation of Ursa Major (the Great Bear). It is receding from us at approximately 883 kilometers per second. The name “Arp 336” derives from being included in Arp’s Atlas of Peculiar Galaxies, a catalog of 338 peculiar galaxies, drawn up by Halton Arp in the years from 1962 through 1967 and published by the California Institute of Technology. 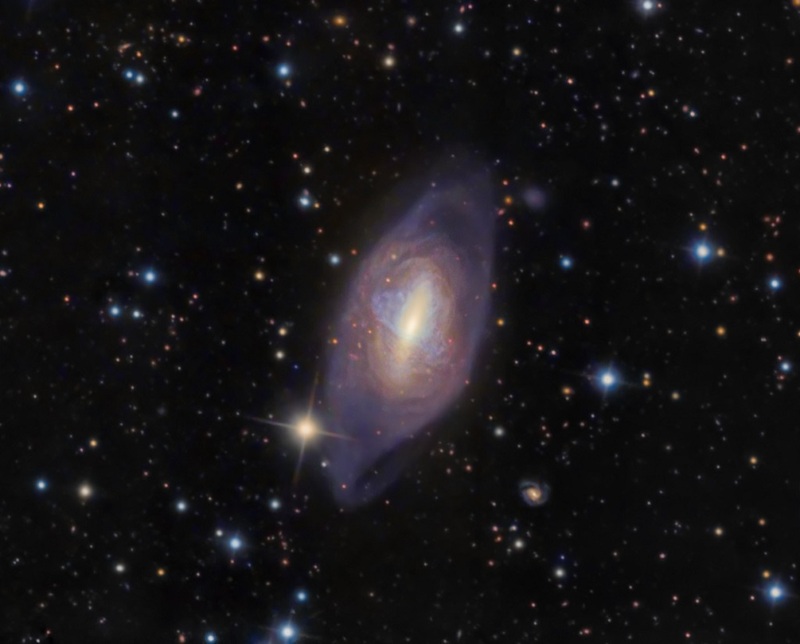 A polar-ring galaxy is a rare type of galaxy in which an outer ring of gas, stars and dust orbits in a plane almost perpendicular to the normal flat plane of the galaxy. These polar rings are thought to form when two galaxies gravitationally interact with each other. One possibility is that material is tidally stripped from a passing galaxy, with the captured debris strung out in a rotating ring. The other possibility is that a smaller galaxy collides perpendicular with the plane of rotation of the larger galaxy, with the smaller galaxy effectively forming the polar ring. In the case of NGC 2685, several thin filamentary strands, consisting of knots of luminous star-forming regions and hydrogen gas form a helical band perpendicular to the main disk and centered on the galactic nucleus. These structures suggest that NGC 2685 once had a much smaller companion that was captured into a polar orbit and had its stars eventually merged with those of the larger system, leaving behind the companion’s interstellar medium. New generations of stars formed from this material to produce the luminous ring seen today. The rotating ring of NGC 2685 is found to be remarkably old and stable. It is possible that if the Magellanic Clouds had been closer to the Milky Way, they too would have created a polar ring around our galaxy. In this image, the strange, perpendicular rings are easy to trace as they pass in front of the galactic disk, along with other disturbed outer structures. NGC 2685 is seen amidst lots of foreground stars and background galaxies.